I feel like a little kid with butterflies again. Will I like it? Will I learn something fun? Will I have a TON of homework? You know, all the normal things/questions that go through your head before school. To mark the beginning to the semester I pulled together my favorite back to school items. I wish I had each of these items with me today, especially those notebooks. They are so cute! great list! I start next week. Good luck with classes! Love all of these items! Have a great first day back!! good luck- love the bag! 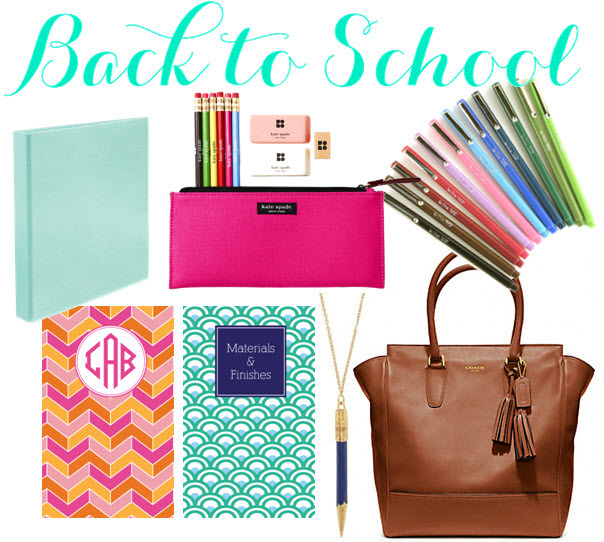 you'll be the most stylish student in class with those items! What are you doing back in school? Good luck, I'm sure you will like it. I think we might have a similar story going on here, I will have to send you a note! Good luck. I liked going back to school after I got married...the teachers were the same age, so I wasn't intimidated. Love your list! What is the font that you used for the title its so pretty! Im looking for a font similar to make my grandmother's invite. I love everything you picked!! Wishing you the very best this holiday weekend!! Hope your first day back went great! I love all of your picks...especially that bag! If you get a sec, I'd love to hear your thoughts on my latest posts! this coach bag is amazing!! I love how you make your collages!! They are really fun to look at visually and with great conten! !